Gold is still in a downtrend, if you examine a chart of gold prices measured in dollars. But gold in euros looks much stronger, and that’s actually a bullish condition, eventually. People often ask at what dollar price is gold likely to find support or resistance. But it can be argued that the dollar price of gold is not very relevant for a lot of the old-school technical tools. The static price levels of prior highs and lows do not generally show much significance as support or resistance agents once they are reached again. The big reason for this is that gold is traded around the world, and in every currency. So what might look like an important support or resistance level on a dollar-based chart could look totally different in another currency. The whole point about why prior price levels can act as support or resistance is based on the principle that traders remember buying or selling at those prices. So when that price is encountered again, a trader who thought it was a good place to buy is likely to do so again, if he has any money left. But that factor gets diluted when gold trades all around the world. Seeing the dollar price return to the level of a prior high or low might not spur any reaction at all from a trader who operates in another currency. 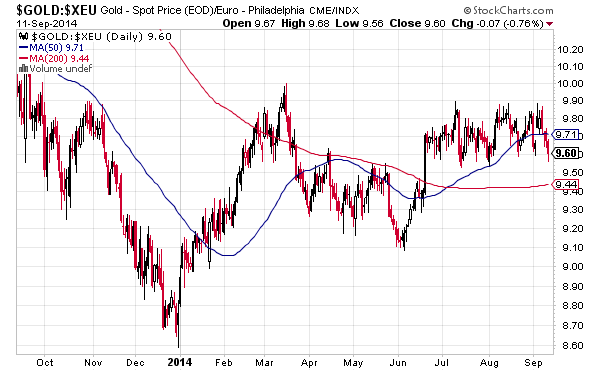 The chart above shows gold priced in both dollar terms and in euros. They are obviously similar, which is what we would expect. But when there are differences, then those differences can be instructive. I have found that when the two plots disagree, it is usually the euro price plot that ends up being right about where both are headed. This can take the form of simple divergences, or the breaking of a trendline earlier or later than the same trendline in the other plot. There are 3 pairs of dashed trend lines drawn in that chart, and for the first two the euro price of gold broke the trendline before the dollar price, giving us an earlier warning about a change in trend. The most recent line has already been broken on the euro price plot, but not yet on the dollar price plot. Perhaps more important, the euro price of gold seems to be encountering overhead resistance at around the €1000 level. Round number resistance is nothing new; we saw it quite extensively at Dow 10,000 (remember the hats?). But a gold trader who only thinks in dollar terms would miss that insight. Gold is due for a new upward phase now, according to the 13-1/2 month cycle that I addressed here back in July. The ascending phase of a new 13-1/2 month cycle is usually where the big gains are found. But first, gold has to finish up the business of putting in a bottom. The way I see it, once gold starts upward and breaks up through the €1000 euro level, a “recognition wave” of follow-on buying will occur as euro-based traders recognize that the €1000 level has been breached. Gold is currently at €960/oz, so it does not have far to go to make such a breakout. One point to note is that StockCharts.com’s data provider quotes the euro to dollar exchange rate 100X higher than actual, which is an indexing convention left over from years ago. So the 10.00 level on that chart is equivalent to the €1000 gold price. And if you really wanted to, you could trade the price of gold in euros using a fairly new ETF, the AdvisorShares Gartman Gold/Euro ETF (NYSE Arca: GEUR), which just started trading in February 2014. I don’t advocate pro or con for that ETF; I just bring it up to point out that it is now a possibility. GEUR has only $1.3 million in assets so far, which is really thin and so getting proper fills could be an issue especially if trading in any big size. And GEUR has a fairly high expense ratio of 0.70%, versus 0.40% for GLD and 0.25% for IAU, the two main dollar-based gold bullion ETFs.